I’m generally more of a crafter than a maker, so things like the Arduino (which is very well known and popular in the maker scene) are still pretty new to me. So it was pretty exciting when I got to talk to Pierce Nichols about an Arduino technology that he created himself. For those of you who aren’t aware, according to the Arduino website, it’s, “an open-source electronics prototyping platform based on flexible, easy-to-use hardware and software”. From what I can gather this means you can program your Arduino to do anything it’s capable of in an easy way. You can add hardware to it as well to increase its functionality. It allows the average person to build really neat electronics. Pierce’s creation is called the Zigduino, a shield and software compatible Arduino variant, that has built-in 802.15.4 radio. Normally, when you want to add functionality to an Arduino, you add what’s called a shield. For example, with a shield called WeatherShield1, you can read temperature, pressure and humidity from the environment. Another, called the LoL LED Matrix Shield, allows you to display anything on a grid of 9x14 LED lights. 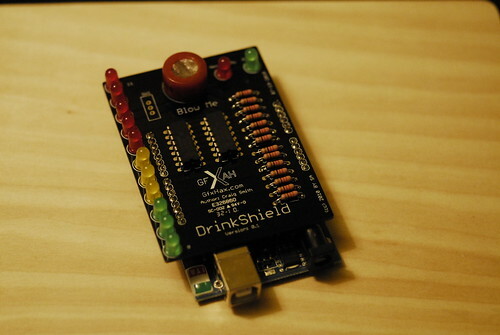 According to the Arduino Shield List, there are 222 shields (and counting!). This means there are at least 222 really neat things you can do with your Arduino! There is a radio shield already, called the XBee. However, Pierce has taken a different route than just creating a new shield. His uses an integrated chipset, which means you don’t have to give up any Arduino pins to use it, and it’s compatible with any 3.3 volt Arduino shield. 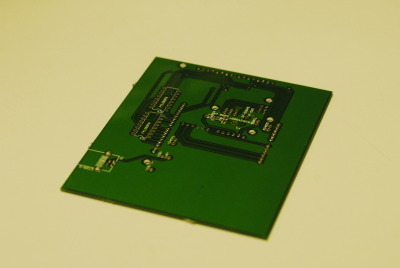 As I mentioned before, the purpose of the Zigduino is to add the capability for using radio. Because it uses 802.15.4 radio, it can talk to ZigBee, 6LoWPAN, and other mesh networking protocols. You might be wondering what kind of use the Zigduino would have. Well, Mark Atwood (who you may remember as having the RFID door lock), currently has two installed. One is in his door, and the other in is his server. This allows for fast and wireless communication between the two. Pierce told me that he thinks it would be cool to build a robot that was wirelessly controlled by a Zigduino. (I think it would be cool to then send it outside with a WeatherShield1 attached to let me know what it’s like outside. Checking the Internet isn’t as much fun!) Or how about a bunch of Zigduinos networked together to form their own mesh network? And of course, without Metrix, it might not have been possible (or at least it would have been harder to do!) Pierce said to me, “Metrix has been an invaluable prototyping lab. Plus it’s a place to meet collaborators and testers, and all sorts of other folks who have given me advice and help.” I’ve seen him working on this project for a while now, and it’s nice to hear that he’s has a positive experience. And soon, he’ll be moving on from prototyping at Metrix to something much larger. With many people requesting his product, he’s hoping to go into production through a distributor. His idea came to him last year at CES, and has already become a company, Logos Electromechanical, and a great product, the Zigduino. I think this goes to show that if you have an idea for a product, create it! You never know how many people (besides you) were looking for that exact same thing. If you’re looking to pick up a Zigduino, Pierce is taking reservations for the first production batch! Check out his website logos-electro.com and send him an email! If you have an interesting project that you’re working on at Metrix, and would like to be featured in the blog, email me-allison@sweetium.com.